At Swanage Primary we take the safety of our children very seriously. Whilst the internet is a fabulous resource and tool for learning, there are some very important rules that we expect pupils to abide. We have previously sent a copy of these SMART rules home and would like parents to discuss them with their children. You may wish to download some of the leaflets below to read and share with your children. The kidSMART website is an excellent source of information and there are some games and activities on there for the children to do. Lets work together to keep our children safe. We've watched these film clips in school to understand what SMART means and how we can use and enjoy the internet whilst staying safe. Watch them again to remind yourself of Winston, Kara and Cookie's adventures! The SMART Crew Chapter 1 What is it safe to accept online? The SMART Crew Chapter 2 What is reliable online? The SMART Crew Chapter 3 What should you keep safe online? The SMART Crew Chapter 4 Who should you tell if you're worried about something online? 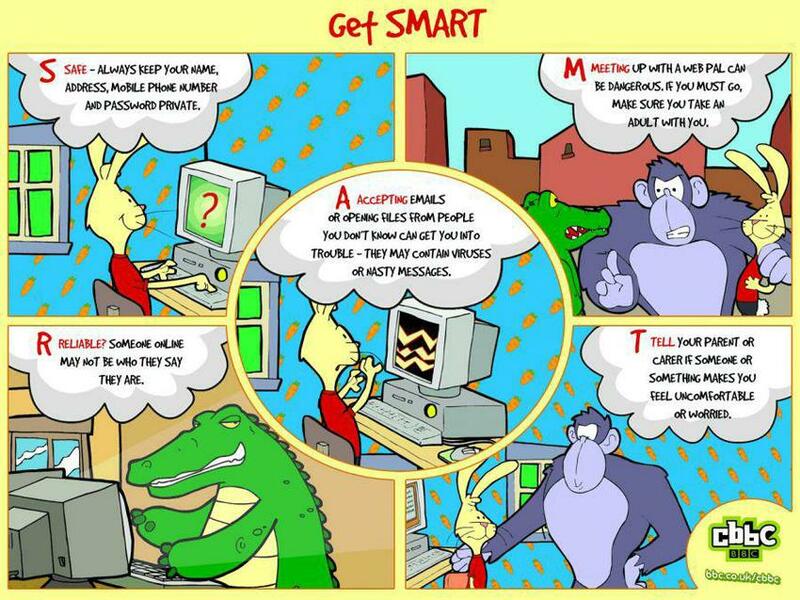 The SMART Crew Chapter 5 Is it safe to meet up with someone you've met online? Social Media Guides Find out more about the safety features available on popular social networks.